Bible Prophecy Patterns: Timeline at the Exodus. Comparison of years with days of equal value ==> Israel spends 350 days at Mount Sinai after coming out of Egypt. From arrival at Mount Sinai until 40 days after leaving, at which time they sent out spies, are 350 + 40 = 390 days. From arrival at Mount Sinai until the completion of the 40-days spying, are 390 + 40 = 430 days. From entering Egypt until Moses' birth are 350 years. From entering Egypt until Moses' flees from Egypt at age 40, are 350 + 40 = 390 years, (Acts 7:23-36). From entering Egypt until when Moses takes Israel out from Egypt are 390 + 40 = 430 years. On the anniversary when the spies returned with an evil report about the land, for which Israel was sentenced to 40 years wandering in the desert, ---"a day for each year they spied out the land, " --- it happens that 430 + 430 years later Israel again went captive into Egypt (and Babylon). 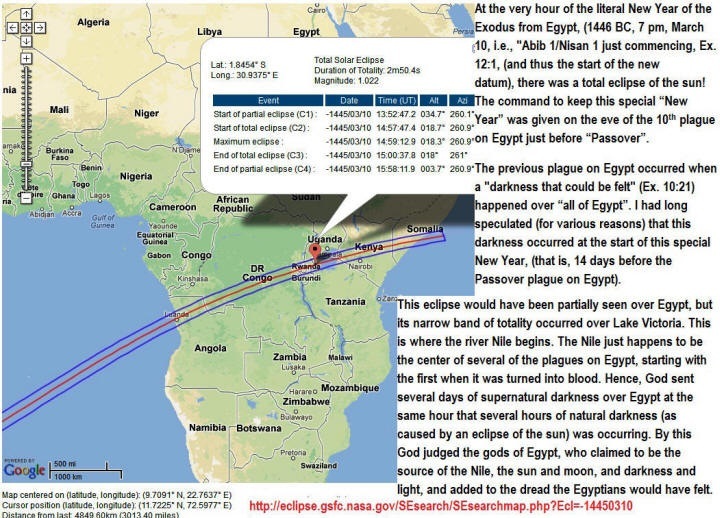 This happened in fulfillment of Ezekiel's prophecy as concerning the "390 + 40 (= 430) day-years," (Av 10th, 586 BC, Ezekiel 4). At age 77, Jacob worked for a wife for 7 + 7 years, exactly 483 years before the Exodus, etc. He was born 70-times-8 years before the Exodus, and died at 7x7x3 years of age. 483 years after the Exodus (and tabernacle), comes the middle of the 7-years building of the temple of Solomon, 1Kg. 6:1. 490 days from Mount Sinai until the Day of Atonement (which should have been the commencement of the Day and Year of Jubilee), plus another 490 x 3 years is AD 26, when Christ began His half-of-a-seven-year ministry. This pattern is strikingly similar to the before-mentioned 430 x 3 years (between the captivities), with the 430 days between the arrival at Mt. Sinai and the 490th day of the year--- when the spies returned with evil report. "This month shall be unto you the beginning of months: it shall be the first month of the year to you, (Exodus 12:2). "And it came to pass in the first month in the second year, on the first day of the month, that the tabernacle was reared up," (Ex 40:17; see also Numbers 1:1; 9:1; 10:11). "And Aaron the priest went up into mount Hor at the commandment of the LORD, and died there, in the fortieth year after the children of Israel were come out of the land of Egypt, in the first day of the fifth month," (Numbers 33:38; see also Deuteronomy 1:3). "And it came to pass in the four hundred and eightieth year after the children of Israel were come out of the land of Egypt, in the fourth year of Solomon's reign over Israel, in the month Zif, which is the second month, that he began to build the house of the LORD," (1Kings 6:1). "And your children shall wander in the wilderness forty years, and bear your whoredoms, until your carcasses be wasted in the wilderness. After the number of the days in which ye searched the land, even forty days, each day for a year, shall ye bear your iniquities, even forty years, and ye shall know my breach of promise. (Numbers 14:33-34). It is most interesting that the above 40 days that they spied out the land ended on the 490th day from the New Year datum, but 430 days from when they entered Mount Sinai, and 40 x 2 days from when they left Mount Sinai! Those familiar with bible prophecy numbers will find this most astounding. The following is but one of many such examples given in brief after the charts. I discovered the above while working on the below automated calendar. After two decades, the above calendar converter is final out! The 490th day from the New Year datum of the 360-calendar. From entering Egypt until Moses' birth are 350 years. From entering Egypt until Moses' flees from Egypt at age 40, are 390 years, (Acts 7:23-36). From entering Egypt until when Moses takes Israel out from Egypt are 390 + 40 = 430 years. Israel spends 350 days at Mount Sinai after coming out of Egypt. From entering Mount Sinai until 40 days after leaving from there are 390 days; at which time they send out the 12 spies. From entering Mount Sinai until the 40-days spying are 390 + 40 = 430 days. All this occurs after the said 430 years captivity! Moses is 40 + 40 years old! The two 40-day periods in which Moses went up Mount Sinai are in parallel with the two 40-day periods just mentioned; they are separated by (nearly and exactly) 49 x 7 days, (which is 7 x 7 x 7). This agrees with the 490th day mentioned at top. The lunar calendar brings out variations to the above; for example, instead of the 490th day, it is the 483rd day. Remarkable both, however, are in agreement with Daniel 9:20-27. The precision of these dates is mind-bending! 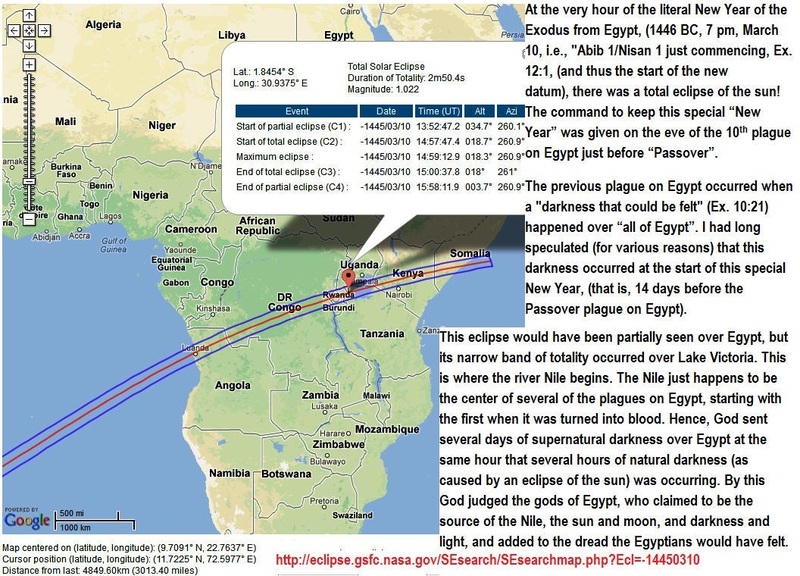 The bible says that Israel was in Egypt exactly "to the day", 430 years unto Passover of 1446 BC. Ezekiel simply counts, not from just the first day of Passover, but from the whole week of Passover, and then counts 430 days from this week unto when the spies went out to spy the land for 40 days. Because of their unbelief, Israel was sentenced to wander in the desert "a day for each of the 40 days they spied the land". Thus, they entered the Promised Land in 1406 BC. Therefore, this means that the 40-days of spying out the land exactly corresponds to the 40 years of the wilderness wandering. 430 years "to the day" from the Entry into Egypt (1876 BC) unto the Passover of the Exodus (1446 BC), plus 40 years unto the Promised Land (1406 BC). 430 days + 40 days from the above Passover week (1446 BC) unto the 40 days that the spies spied out the land (1445 BC, Av. 5-12). Also, "The day equals a consecutive year/date of time" principle.